Woot, there's a new Samsung SGL Carbon Composite Material joint venture in town and it's made by Samsung's Petrochemical department getting cosying up to SGL Group, which just happens to specialize in graphite and carbon-fiber composites. SGL Group’s carbon-based materials combine several unique properties such as very good electrical and thermal conductivity, heat and corrosion resistance as well as high mechanical strength combined with low weight. Products from SGL Group are used predominantly in the steel, aluminum, automotive and chemical industries as well as in the semiconductor, solar and LED sectors and in lithium-ion batteries. Carbon-based materials and products are also being used increasingly in the wind power, aerospace and defense industries. Our long-term cooperation with SGL Group will ensure the exclusive supply of carbon fiber composite materials to Samsung. We selected SGL Group as partner due to the company’s unique expertise along the entire value chain from carbon fibers to CFRP components. Lightweight materials have become an important factor not only in industrial applications but also the consumer end markets such as digital media. This partnership will position Samsung as a leading player in the development and application of carbon fiber-based products. Meanwhile, apple signed a chip production deal with TSMC, to continue producing their revolutionary chips. Equal Efforts, Equal efforts everywhere. How are apple chips revolutionary??? You got to give Apple the credit they deserve as they are the ones that are constantly pushing the GPU performance up. I thought Apple design the cpu, and PowerVR designed the gpu. And where did i say Apple designed the GPU? They simply care about GPU performance and usually use the best GPUs available at the moment of release, the iPad 4's GPU is massively powerful. powerVR licenses it to apple and apple modifies it for their purpose. Coz Octa is marketing gimmick. 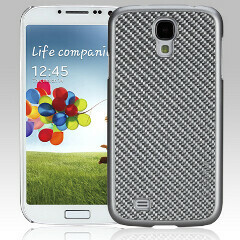 We all need tougher, lighter and Powerful phones... Bring it..
Motorola has used carbon fiber for a while now. Can't wait to see what improvements Samsung will bring. Motorola used carbon fiber.. But Samsung formed carbon fiber + composite, this thing will be GOOD!! I agree. I can't stand the Motorola look with Kevlar backing. Although I am sure Samsung will make it work like Lenovo and the X1 ultrabook. Other manufacturers better work hard once Samsung starts using this material. light & strong. This will put the cheap cola can (aluminium) to shame. Apple invested big in carbon fiber last year. Society asking for more "Durable" phones, is equivelant to asking for more expensive phones. This sounds rather counter-productive considering 88% of smartphone owners purchase cases to put on their phones regardless of quality or durability(iPhones are a perfect example). Why ask for something more expensive if one is going to cover it anyway? I want to pay less for my phone; not more. I only hold onto it for two years at best. I've had no problem with my phone lasting this long other than battery issues. Only another reason why I hope accessibility is not lost with this news. John B.